While the impact of labour migration and remittances on the economies and societies of the migrants’ countries of origin is well documented, their influence on religion remains relatively underexposed, especially when it comes to the countries of the former USSR where labour migration, to Russia in particular, has become a major economic and social dynamic. Yet as the example of the Vakhsh valley in Tajikistan shows, large-scale seasonal and international labour migration and the stark social and economic changes that it causes affect both the perception and practice of Islam in ways that challenge the usual fixation on ‘religious radicalisation’. 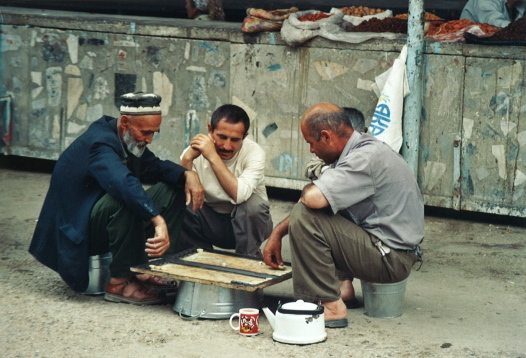 Tajik men playing backgammon during a break in a bazaar (©2006, Bruno De Cordier). When one strolls around the central bazaar of Kurgan-Tyube, a town of about 80,000 inhabitants situated a hundred kilometres south of the Tajik capital, Dushanbe, it is difficult to look past the signs of the prevalence and importance of labour migration and remittances. Ticket counters advertising flights to two dozen destinations in Russia – and, to a lesser extent, to Kazakhstan, Dubai and Ukraine, – are plentiful, just like the money transfer points that are often situated in the same offices, the call shops and the currencies on offer in the money exchange booths. Away from the market, the morning queues of young men at the passport counter and the international status that Kurgan-Tyube’s airport has had for quite some years already suggest the same. Kurgan-Tyube, which is officially called Qurgonteppa, although many still use the Russianised Soviet name, is the administrative centre of Khatlon, Tajikistan’s southern and most populous province. It is also the main city in the Vakhsh valley, a major cotton-growing area that stretches along the river of the same name. According to official statistics, in 2008 Khatlon province had over 140,000 labour migrants in a total population of 2.5 million. The real figure, however, is likely much higher. This situation is in no way unique to Tajikistan, but does reflect the reality of massive seasonal labour migration that exists in all parts of the country. Although not a new phenomenon, the present phase and proportions of labour migration started in the late 1990s due to economic growth and a labour deficit in Russia, and a labour surplus and economic dislocation in Tajikistan and other southern former Soviet countries. Estimates of the actual size of labour migration from Tajikistan vary widely according to the source, yet the most likely number is 630,000-800,000 migrants, depending on the year. According to year and region, between 85 and 95 percent of these migrants, called mardikoron, are men and almost all are of Muslim background. They work in construction, transport, markets, technical services, agriculture and other menial jobs. The remittances from this migration movement amounted up to $2.6 billion in 2008, which was 52 percent of Tajikistan’s gross domestic product, before plummeting to $1.8 billion in 2009 due to the global financial crisis, which also affected Russia and the demand for labour there. Much more than international development aid, in the Vakhsh valley and elsewhere, the effect of remittances at the grassroots level is real and visible in the form of recent maintenance and expansion of houses and farms, a clear increase in cars and other motorised vehicles or European and newer Russian brands that have replaced the worn-out Soviet cars that were still prevalent a few years ago, the spread of new communication technologies such as mobile phones and satellite dishes, and bazaars with much more on offer, thus indicating more demand, as compared to ten years ago. From my personal observations, there is also more confidence and much less lethargy among people than before, despite the weariness with the economic and social factors that oblige large numbers of men to make a living away from their families. That this growing religiosity (or at least religious identification), like any social and ideological movement that is difficult to control, makes the regime in Dushanbe and the Soviet-style secular elites not a little nervous is clear from a number of laws and measures put in place over the last ten years to curb, if not discourage, religiosity, leading some to claim that Tajikistan has a problem of secular rather than religious radicalism. Among such steps are the prohibition on women and recently also minors from visiting mosques, the imposition of a government-issued list of approved sermon topics, the closure of non-official mosques, the restriction of permitted Islam to the traditionally dominant Hanafi Sunni school, and increasing pressure on independent religious opinion leaders. In 2010 came the forced repatriation of hundreds of young Tajiks who went to Al-Azhar and other institutions in Egypt, Pakistan, Saudi Arabia and Iran to study Islam. The latter formed a comparatively tiny, but socially all but insignificant educational migration, in the sense that it involved young Tajiks who acquired religious knowledge that was often of a higher level than that of the official clergy, who are mandated to back the government line, and that of the muysafedon – elders who traditionally play a leading religious role at the local level, but often have a patchy religious knowledge. As such, the returned students pose a challenge to their authority. In the meantime, many have joined the labour migration to Russia as well. From my field observations and my interaction with former and recently returned migrants (many of them from Moscow city and province, and from Yekaterinburg), informal and formal authorities, researchers, opinion leaders and religious figures in both the capital, Dushanbe, and the urban as well as rural Vakhsh valley, it appears that, as one can expect, migration clearly influences the position and practice of the Islamic religion in several ways. To start with, mosque attendance differs considerably during and outside the migration season – which runs roughly from spring to late fall – due to the absence of many men during the season. The imams of the village mosques in the district of Vakhsh who were asked reported a decrease of one-third to almost two-thirds – a fall in numbers that increases again once the migrants return home. This seemed to be less the case in Kurgan-Tyube, because, as a province capital and market centre, it attracts many internal migrants from rural districts and smaller towns in Khatlon province. ‘Someone who was already a religious person will generally continue to be so over there, and the other way around’, said a young migrant from Bokhtar who worked in garbage collection and in the meat industry. But some of the lads change. You see, it’s my third year that I go to Russia now. I hardly ever practised and prayed here, but started to do it there. Before I went off I was at school and didn’t care much. In Moscow, I lived with twenty people from Tajikistan, of which ten or twelve practised regularly. Our foreman, who also lived with us, was from Kulyab and knew much about religion. He was not a cleric really, but he had a positive influence on us. Also, they may not like us over there, but the Russians appreciate us as better workers because we don’t drink. So that’s how it went. ‘In the nineties, just after the civil war, things were dire here’, another migrant respondent from Vakhsh stated. Everything was in shambles. There was a lot of unemployment and lots of alcoholics and drug addicts. But since we have the migration and more income, people change. There is more responsibility and many became more religious when abroad. Where I worked, at Moscow’s Cherkizovskii market, the foreman was a hajji who had been to Mecca. He was a good organiser and had the authority to get more discipline among the workers. And through that, more people became observant. Some migrants who worked in cities with sizeable Muslim Tatar communities, such as Kazan and Yekaterinburg, told me that the presence of their religious infrastructure also encouraged observance. Whether the increased religious practice of a sizeable percentage of the migrants abroad continues once they return home also depends on the individual and his social environment. According to the imam of a village mosque in Vakhsh, for example, ‘nearly half of those who return here remain indeed more religious than they were before their departure, while the rest become again like they were. It differs. Over there, you are an alien community, and so identity matters more. But once at home, people are back in their own surroundings.’ Other sources had similar views. One student who attended an Islamic institute in Pakistan on an official stipend for two years before he was called home by presidential order also found that during his absence, many of the men in his village who had worked in Russia became clearly more observant than they were before, if not in terms of regular prayers, then at least in terms of abstaining from alcohol. The confrontation with other lifestyles and mentalities while abroad, and the increase in income and living standards that are part of the mixed effect of labour migration and the emergence of the remittance economy, definitely affect self-awareness both among labour migrants and in the communities they originate from. In turn, part of this translates into a stronger identification with religion. Some of the informal authorities who took the lead in religious observance in emigration also continue to exercise that authority once they return home, especially when they acquire higher economic status through the reinvestment of savings and remittances in a business or farm. The fact that in emigration, Muslim migrants, despite practical problems, generally face fewer official restrictions on Islamic practice in the majority non-Muslim host society than in majority Muslim Tajikistan also affects the perception among many of the nature of religious policy in the country, as well as the level of trust that they have in the official, state-sponsored clergy. Remittances seem not yet to have given a serious boost to the emergence of a religious civil society with faith-based charities, social funds and professional associations. Although faith-based charity funded by migration revenue does exist, most of it is informal and not institutionalised in foundations or NGOs. This is in part because of the strong official scrutiny of and clampdowns on religious and faith-based organisations, but also because due to the Soviet legacy, the pious middle class that often takes the lead in religious civil society is still in the process of forming in Tajikistan. One exception is the fledgling social and charitable work of the Islamic Renaissance Party (http://www.nahzat.tj), which has a relatively strong support base in Bokhtar and Vakhsh, among others, and is funded through member contributions that unavoidably also come from remittances, given the importance of these in household budgets. Most charitable and social initiatives, however, are ad hoc, informal, and supported by the kinship and regional network, and happen often, though not exclusively, on the occasion of Islamic holidays. They form a continuation of habits and practices that existed before the migration wave, but are now also supported by migration money. Typical examples that were communicated and observed include contributions in cash or kind by migrants and migrant families to the equipping and repair of village mosques, and to Sadaqa – collections to support poorer families in the village. In some instances, like during the floods in 2010 around Kulyab, Khatlon’s other main town, village mosques and former migrants organised humanitarian aid. Finally, and not least, come the changes that labour migration and the absence of many men, has brought in the field of the division of labour between men and women. ‘The biggest influence of migration can be felt in the invisible framework in which women are traditionally supposed to live’, one NGO cadre in Dushanbe stressed. ‘Do not underestimate this. Much work that was traditionally done by men is now done by women, and for this they have to get out of the house more frequently.’ Observations in the field confirm this. In the fruit and vegetables section of Kurgan-Tyube’s bazaar, for example, more than two-thirds of the vendors were women, which is a clear change compared to the situation, say, ten years ago. A similar situation can be observed in the fields that surround the villages in Vakhsh and Bokhtar. Here again, this is by itself not a religious factor. Yet it becomes one when the absence of the male head of the household, or male family members of active age in general, affects the transfer of religious knowledge and practice that they are supposed to be responsible for. As a result, and because of the recent prohibition on minors to attend the mosque, women increasingly turn to men outside of the immediate family to give their children religious education. This opens a space and role for Tajik returnee students who attended Islamic courses abroad. As with the former students of Islam who joined the ranks of labour migrants to Russia shortly upon their return, the effects of two forms of migration become intertwined in this way. ‘Some fear that the students of Islam who had to return to Tajikistan will “contaminate” migrants and youth with radicalism’, the previously quoted activist in Bokhtar stressed. ‘But the vast majority of these former students are not extremists at all. Many even went abroad on government stipends. What scares some is that they bring in ideas and knowledge at a higher level than what is taught at official Islamic institutes and that they are less easy to keep in line.’ Labour migration is one of the biggest channels that connect areas like Vakhsh and Bokhtar to the global economy. Its effect on society and religion is not so much ‘radicalisation’ as social mobility and the (re-)definition of identity that go with it. This process happens at the interface of the traditional identity, the post-Soviet environment and globalisation. As public spaces for religious practice increasingly face official restrictions in Tajikistan, migration, along with personal and regional networks and the new media, can only gain importance as channels of the increasing religiosity in society. Jamshed Kuddusov, Vliyanie mirovogo finansovo krizisa na trudovyh migrantov iz Tadzhikistana: mneniye migrantov, Moscow and Dushanbe, International Labour Migration and the Ministry of Labour and Social Protection of Tajikistan, 2009, p. 4. For an overview and discussion of the different estimates of the number of migrants, see Alexei Kireyev, ‘The macro-economics of remittances: The case of Tajikistan’, IMF Working Paper no. 06/2, Policy Development and Review Department, 2006, p. 7. Martin Brownbridge and Sudharshan Canagarajah, ‘Remittances and the macroeconomic impact of the global economic crisis in the Kyrgyz Republic and Tajikistan’, China and Eurasia Forum Quarterly, 8(4), 2010, pp. 3-6 and Hojimahmad Umarov, Tadzhikskaya trudovaya migratsia v usloviyah globalnogo finansovo krizisa: pritshiny i posledstviye, Dushanbe, International Organisation for Migration, 2010. Steven Wagner, Public Opinion in Tajikistan 1996, Washington, DC, International Foundation for Election Systems, 1997, p. 44 and IFES (International Foundation for Election Systems), Public Opinion in Tajikistan 2010, Washington, DC, IFES, 2010, p. 41. See also Saodat Olimova, ‘La jeunesse du Tadjikistan face à l’islam et l’islamisme’, Cahiers d’Asie centrale, 15(16), 2007. It must be stressed, however, that the ban on women attending mosques, which was issued by the government-approved Ulema Council in mid-2005 and outraged many, formalised a traditional practice that had long existed in these parts and is, according to some, of local pre-Islamic origin, for in many other Hanafi Sunni societies outside the region, women do attend mosque. Some of these measures, such as the prohibition on minors attending prayer services, also apply to other confessions, such as the evangelical Protestants that came to Tajikistan in the 1990s and often use humanitarian and development aid or businesses as a front. But in popular perception, the measures are seen to primarily target Islam and Muslims. Estimations of the number of Tajiks that followed Islamic studies abroad in 2009 range from 1,350 to 2,200 (David M. Abramson, Foreign Religious Education and the Central Asian Islamic Revival: Impact and Prospects for Stability, Central Asia-Caucasus Institute, 2010, pp. 36-43 and 47). Most interviews and conversations with migrants took place in the rural Bokhtar and Vakhsh districts, who jointly have some 370,000 inhabitants. As almost everywhere in Tajikistan, a substantial part of the active male population works abroad. According to statistics from the state migration agency, there were nearly 13,000 migrants in Bokhtar and 7,300 in Vakhsh, although here again the actual numbers are higher. This has already been briefly pointed out, but not really elaborated on in Saodat Olimova and Igor Bosc, Trudovaya migratsia iz Tadzhikistana, Dushanbe, International Organisation for Migration, 2003, p. 131. A more extensive discussion of the role and importance of avlod can be found in ibid., pp. 59-60. For in-depth case studies on the role of the religious middle class in faith-based civil society, see Janine A. Clark, Islam, Charity, and Activism: Middle-class Networks and Social Welfare in Egypt, Jordan, and Yemen, Series in Middle East Studies, Bloomington, Indiana University Press, 2004.